If you’re looking for summer camps in the mountains or productive projects to fill Idaho’s long summer days, it’s hard to resist 4-H programs. 4-H is the largest non-formal youth educational organization in the U.S., reaching over 6.5 million youth every year. Its summer programs adhere to the organization’s motto of “making the best better,” by using your head, heart and hands for overall health. There’s plenty of support locally—Blaine County 4-H leaders volunteered 2,500 hours to their club or community in 2012. Blaine County teen leaders added 1,100 hours. 4-H summer camps help young people grow in four areas—positive identity and values, social skills, physical and thinking skills, and spirituality. And you don’t have to be a 4-H member to participate. Many young 4-H members will be hard at work on projects this summer for the Blaine County Fair Aug. 4-9 in Carey. Projects run the gamut from archery, citizenship, cooking and scrapbooking, to quilting, baking, horse and leadership. 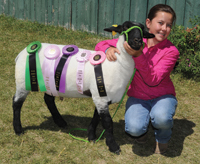 Here’s a sampling of the 4-H summer for 2014. Call 788-5585 weekdays for more details. Start the summer by attending the 4-H Wildlife Day Camp on Saturday, June 7 from 8:30 a.m. to 3 p.m. at Hayspur Fish Hatchery off U.S. 20 near Picabo south of Bellevue. This year’s topic is: “Science with Outdoor Sports and Fishing.” Explore everyday life through the eyes of a scientist and by fishing. Make a t-shirt, enjoy a fish fry, and make it a memorable day of fun. Idaho’s oldest hatchery, Hayspur was built in 1907 and started its brood stock in 1910—stocking other hatcheries beginning in 1920. Morning classes and afternoon stations include talks on Hayspur history, a tour of the hatchery, fish identification and habitat and fishing tackle. It’s a day filled with fun workshops featuring sportsmen. Wildlife Day Camp is geared toward youth 8-13, but children ages 5-7 accompanied by an adult and also youth up to age 18 may attend. You don’t have to be a 4-H member. Parents and families are encouraged to join in and must pre-register. The adult fee of $12 is reduced by half for adults willing to be group leaders (that is, not teaching classes). Pick up registration forms at the Blaine County Extension Office. Cost is $15 per camper by the early deadline of May 20, or $24 through the deadline of May 27. The fee covers lunch and snacks, all supplies, day insurance and the t-shirt. The Rough & Rowdy 4-H Horse Camp goes from Thursday through Saturday, June 12-14. It’s an outdoor experience for ages 8-18 at Blaine County Fairgrounds in Carey. Cost is $60. You don’t need to have a horse to participate. Young people camp under the stars and ride all day with clinics, trail rides, workshops, leather crafts, cowboy poetry, shooting sports and campfires. You can bring a horse, but you don’t need to. Pick up application forms at the Blaine County extension office in Hailey, 788-5585. Space is limited to the first 48 campers. Meals, snacks, supplies and classes are included. Be sure to check two 4-H outdoor camps offered for kids ages 8-13 (grades 3-8) at the Central Idaho 4-H camp 18 miles north of Ketchum. It features hiking, campfires, a scavenger hunt, fishing, talent show and karaoke, and fun workshops at the Central Idaho 4-H camp. On the agenda are swimming, science, hiking, cooking, relay games, dancing and making new friends at Central Idaho 4-H camp. Cost for each camp depends on whether you register early (by May 16), regular (by May 31) or late (by June 13). Non 4-H members pay $120, $130 or $150 depending on when they sign up. The costs for 4-H members are $110, $120 and $140, the higher fee for late registration. Invited are youth who have finished grades 8-12. College-age young adults may attend as college volunteers, and adults as chaperones. Participants stay in university dorms, eat at the cafeteria and, according to the brochure, “survive without sleep for much of the week.” The program includes educational, recreational and social events. Cost is $275 for youth delegates and $200 for adult chaperones who register and pay before the May 16 regular registration deadline. Visit www.4h.uidaho.edu for details. Or call 208-885-7700.